CHENNAI: A 58-year-old woman gave birth through assisted reproductive technology at a private hospital here. The birth was achieved through an intra-cytoplasmic sperm injection using egg from a donor. The couple, Vedam and his wife Selvamary from Ramnad district, have been married for 36 years. Vedam, 60, used to work as a machine operator in a private company in the city. 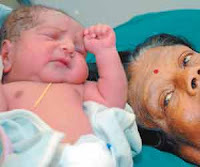 The two were desperate for a baby and had tried all kinds of treatment until Selvamary achieved menopause 10 years ago. On reading about Aakash Fertility Centre in a newspaper, they approached the clinic and were told a baby was possible with a donor egg. Ten months later, the procedure was performed with sperm being injected into donor eggs, which were then grown in an incubator. Four days later, the eggs were transferred into Selvamary’s womb. Laser assisted hatching had been used on the eggs to improve chances of implantation. However, after three months, one of the embryos was aborted naturally, but the other survived. On Tuesday morning, at 8 a.m., Selvamary gave birth to a healthy baby boy through a C-section, said Dr Jeyarani Kamaraj, infertility specialist at the hospital. Selvamary is the oldest patient to have had a baby at the hospital, which had a similar case last year in which a 55-year-old woman gave birth to twins. This has been made possible through our faith in God and in the doctors here. It has been a life-changing experience for me, said Vedam. Originally posted on December 2, 2008. What Every Woman Should Know About Her Biological Clock is the first book to explore a woman's reproductive life span completely, from beginning to end. Based on Cara Birrittieri's own experience of running up against a slowing biological clock, she shows women for the first time how to "tell what time it is" with a simple blood test that gives them a peek at the state of their ovaries. In the beginning ivf treatment was only for women upto 42 year but now it is amazing to hear that a 58 year old women gave birth with this treatment.